Initially, Denise and I headed for Latourell Falls. The sky was foggy, the temperature cool, so I was not overly excited, but I wanted to stretch my legs and take some photos with my new camera. Once we got on the scenic highway at Corbett, plans evolved. We stopped at first great viewpoint, known as the Portland Women’s Forum Viewpoint. Not a bad seat in the joint. I’d never been to the far end to the parking lot before, with slightly better views of the river and a classic look at Crown Point. 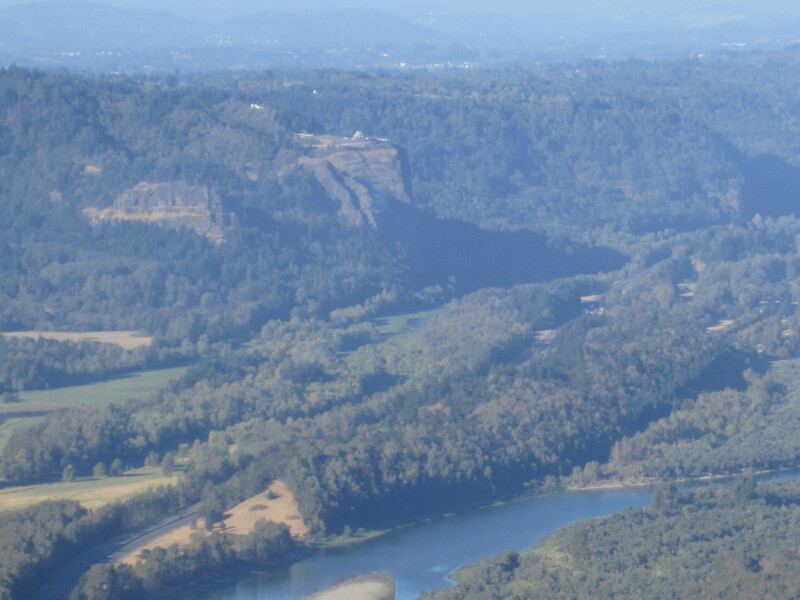 From there, we drove to the nearby Vista House atop Crown Point, then dropped into the trees on the winding road to the first big falls of the Gorge. Someone scalloped the sand. Christo? For a few reasons, we didn’t set out on a real hike at Latourell Falls, which I’ve previously documented on this site. Instead, we strode up the first steep pitch to a nice viewpoint of the falls, then turned back. I was thinking Shepperd’s Dell would be our next spot, but I forgot all about Bridal Veil Falls State Park! Silly me. It isn’t dramatic from the road, but this is a hidden gem with two very different trails. Since Denise had not seen the river overlook trail, we skipped the waterfall trail and ambled about the meandering flat trail. 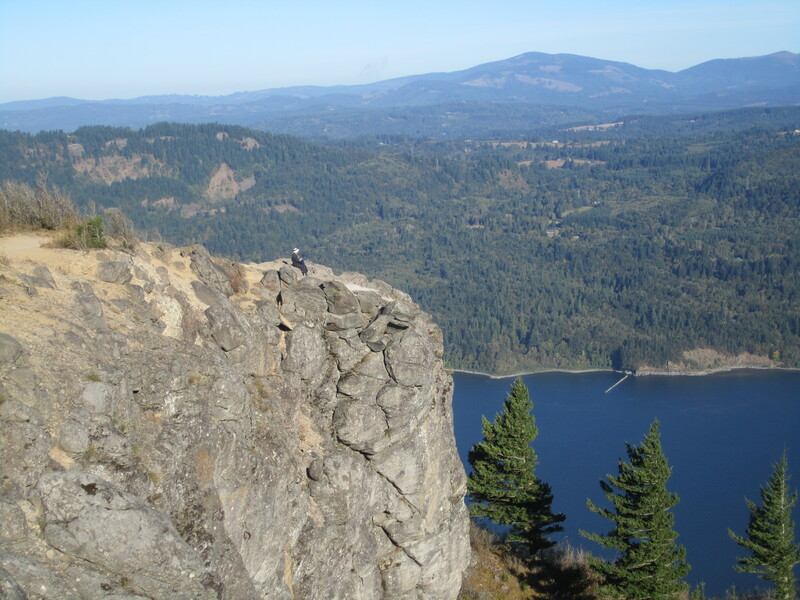 There are views of the mighty Columbia in both directions, and great head-on looks at the Washington side of the Gorge in the Cape Horn area. Shepherd’s Dell is not much of a spot to hike, but it has a cool falls, which is made more mysterious by upper reaches I’d never before noticed. The watercourse almost corkscrews. 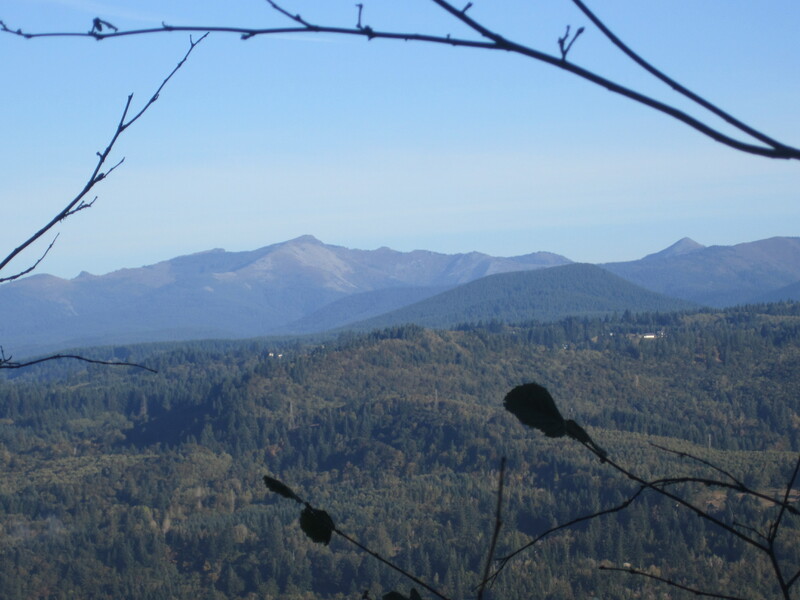 Cascades are visible through the trees along the highway which are invisible from the trail itself. This is a great little spot for a rest. Like its big brother Multnomah Falls, Wahkeena Falls is a popular spot, and with good reason. The falls is not one clean plunge, but a couple of horsetails and a cascade below to boot. The base of the main falls is easily accessible by paved trail. Knowing this, we cruised up there. It only takes a few minutes. I was impressed by the flow and the breeze which that created. I didn’t dally long by the falls proper, but continued past. We hiked up about 11 switchbacks to Lemmon Viewpoint, which took perhaps 20 minutes. I didn’t remember how tough the trail was, but it was easy, and the views were great. It was a nice capper to another great tour of the Columbia River Gorge. Note: In double checking spellings of a couple waterfalls, I stumbled on a cool site for waterfall lovers, Northwest Waterfall Survey. I knew a number of the names, like Ecola and Mist, but was not aware of Dalton, Little Necktie, and a few others. Just when I needed new ideas for local exploration! Happy hikes, everyone. 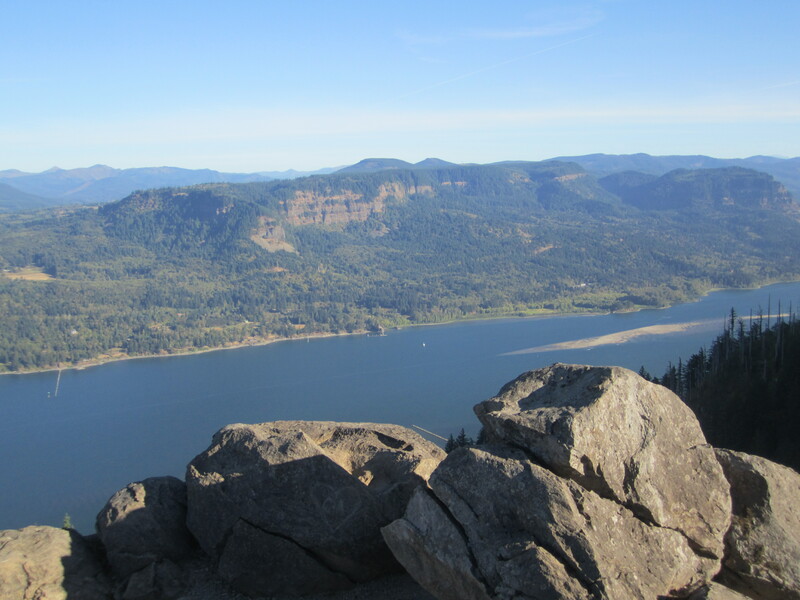 One of the best short hikes in Oregon lies at the west end of the Columbia Gorge. After spending a night in the city, I decided to take a gander at one of my favorite hikes from my college days, Angel’s Rest. It had probably been at least 15 years since I hiked it, and I was curious to see if it was enjoyable as I remembered. Looking north to Silver Star Mountain in Washington. Fond memories. The trailhead is easily found just off Highway 84 at the Bridalveil exit. There’s no need to disguise it, as this area is obviously no secret. I was there at 8 a.m. on a Sunday, and there were already seven or eight cars there. Not exactly undiscovered, but still a gem. I passed one couple on the way up, enjoying the cool morning. Somehow, although I almost felt underdressed, I was sweating. I soon got views through the trees and spots where the trail opened up on old mossy rock slides. Below me lay the mighty Columbia River, one of the largest rivers in North America. An impressive sight, indeed. 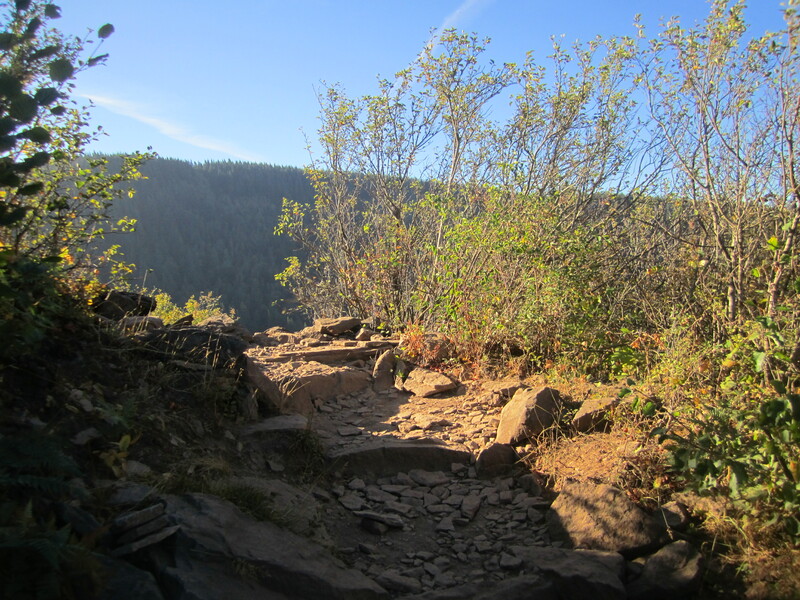 The trail soon crosses a creek, then grinds through some relatively painless switchbacks up the ridge. There are various views along the way. Eventually a rocky brow appears above the switchbacks, but it still takes a while to get to the top, including crossing a broad rockslide decked out with two improvised rock shelters. No, I am sure these are not the remnants of a paleolithic society. 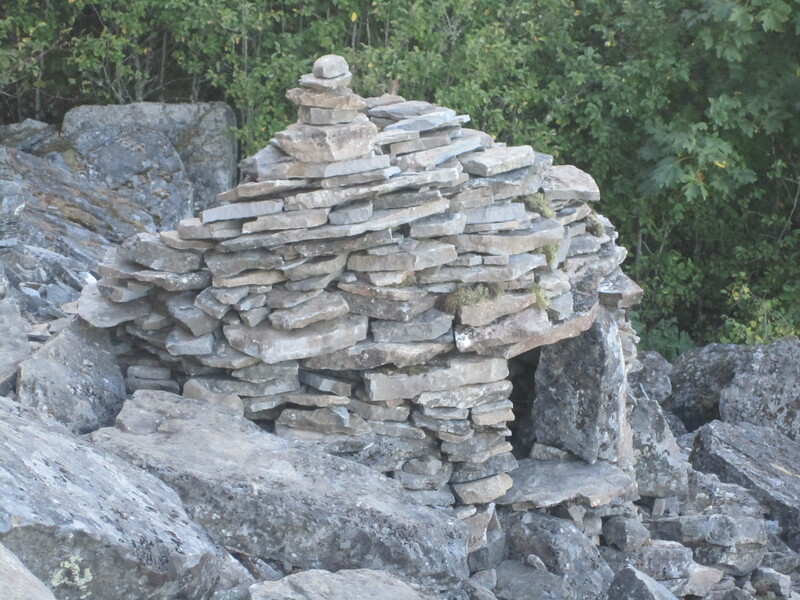 A more likely scenario: a hiker had way too much time on her hands. I reach the top of Angel’s Rest in an hour. It is a spectacular rocky spur jutting out over the Gorge, its open nature reminiscent of much higher alpine spots. There are great views to the north, east, and west. Jackie and I have the rocky ramparts to ourselves until the couple I passed walks by with a nod. They meander to the far end of the promontory, where they soak in the views. View from the top. The only other people on top take in the view. I am glad that the top is warmer than the woods. I relax for a while, but I need to get back to business. It is over an hour home and I have work to think about and bills to pay. So: onward and downward. A lot more people were hiking up now. Some seemed ill-prepared, but so it goes on a trail close to the highway. A number of hikers had dogs. 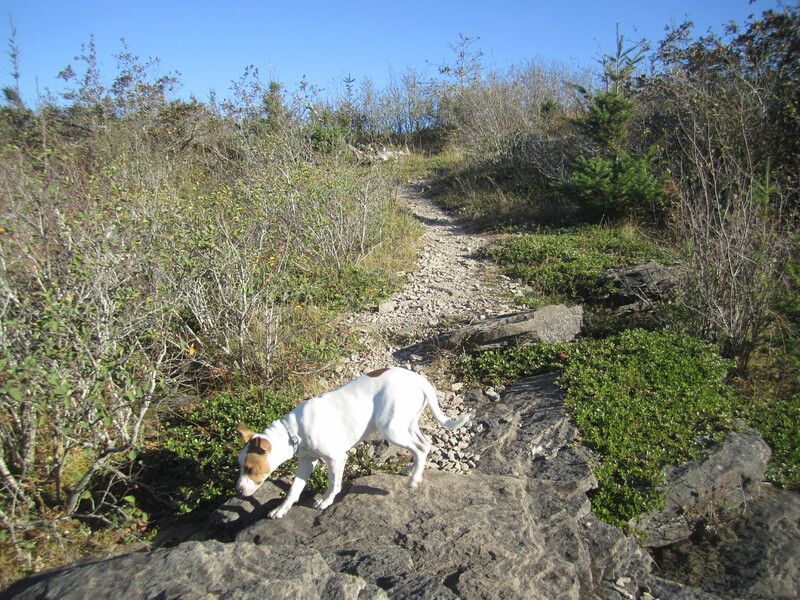 To avoid hassles, I put Jackie on leash for most of the descent. He is an easy pup to control, and our descent was smooth. We got back to the car by 10:30 a.m., having hiked 4.6 miles, pleased with ourselves. Jackie would sleep well on the way home. And yes, the trail is as good as I remembered.